Linking up with Jenna and Anne today! Videos of R to my family! All nine of us are in a group text together, and I'm always sending fun pictures and videos. Since my family lives in Texas, they don't see her as often as they would like, so little videos and pictures will have to do for now! Jordan and I had a terrible time of it two weekends ago. He had the flu and I, unrelated, caught a stomach bug. THEN I passed him the stomach bug, so there was much puking and therefore lots of Sprite and Saltines. Luckily I had a cute shopping buddy when I went out for more supplies. ...of my favorite place in the whole world, which is where I'll be this July! My whole family is getting together to celebrate my grandpa turning 80, and we're all going to see a Cubs game in Chicago! Maybe we will even get a chance to return to the scene of the crime and show R where her parents made it official. Jordan and I are celebrating FIVE YEARS of marriage this May! I know five years isn't really that long, but it still is crazy to think we've been married half a decade. Good thing Jordan isn't turning 30 this year, or I wouldn't have been able to throw him an epic surprise party. Did you know I have an obsession with soy wax candles? Well I do. Don't know what to get me for my birthday or Christmas? Just buy me some candles! I stopped buying Bath & Body Works candles because I read about how much fragrance and chemicals are used and it freaked me out. I love natural soy candles that smell good and are good for you! Honestly? That has literally nothing to do with what I'm currently smelling, because candles are expensive so I don't buy them as often as I would like. If you want to know what I'm smelling RIGHT NOW, it's the lingering aftershock of a certain baby's poopy diaper that I just changed. On second thought, maybe I should go light a candle. Two house-related things have been giving me all the heart eyes lately. 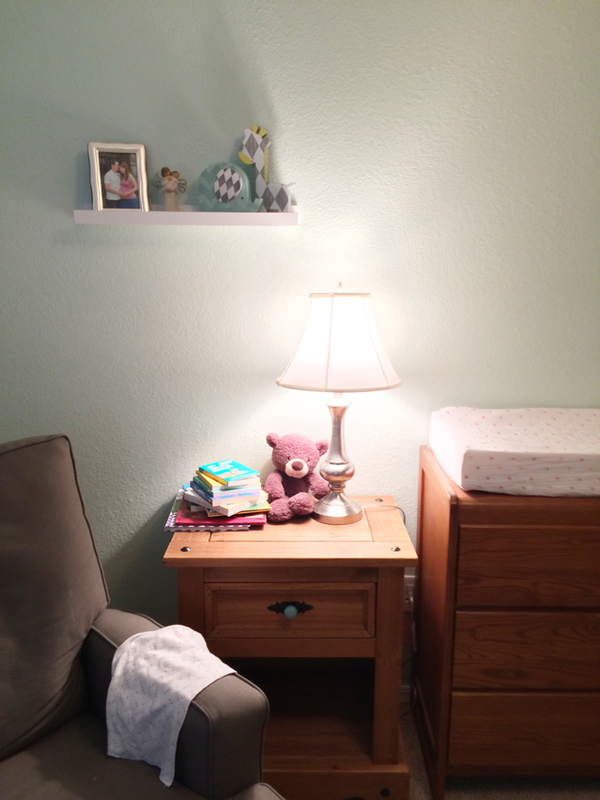 1) The new nightstand I picked up for $30 on Craigslist for the nursery! We had been using a TV tray, which, while classy, wasn't exactly the decor look I was going for. Here is a picture of the finished corner, with our rocking chair that we finally bought. Two months after I had R! I would never recommend waiting that long to purchase a rocking chair when you have a newborn. Rookie mistake. But FYI, it's from Babies 'R' Us, and I absolutely love it. So comfy. In case you're interested, here is a before/after shot of the corner from back in August when I first posted about the nursery. Check out the rest of the room here! The nightstand is from Pier One with a blue knob on the drawer from Anthropologie. Thirty dollars! Winning. 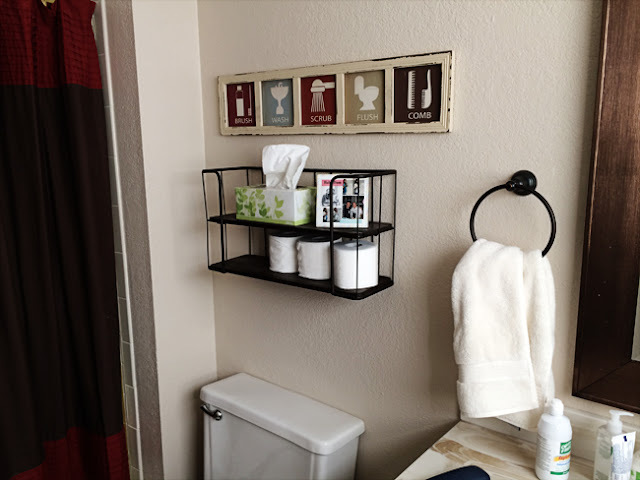 And second, thanks to your helpful suggestions on this post, I decided to go on the hunt for something to hang above the shelf I hung in our bathroom. I found this at At Home (formerly Garden Ridge) and love it! Now I just need to find a small clock to put on the shelf, because it's handy to know what time it is when you're in the bathroom. Thanks, Ali, for the clock suggestion! What do you think of my house additions? Do you shop on Craigslist? What are you smelling right this exact second? That sounds like a really fun trip! We don't have any trips coming up, but I always love having something to look forward too! Have a great day! Craigslist is the way to go! Minus the sketchy part of Craigslist. We have been able to score some fabulous furniture for crazy cheap. R's room look so cozy!! We totally shop Craigslist! I'm currently sitting on our new couch that we got from CL just two weeks ago. I love it. :) As for smelling... not much of anything I suppose. I should light a candle! $30?! That's amazing! And confession: Some fluke happened with our registry and our rocker just got sent to us. For free. My mom felt so guilty about it (WHY) that she called and tried to return it, but the person she got on the phone was so confused and ready to go home for the day that they told her to just keep it. WINNING. I am sure your family loves getting videos of you daughter to watch her grow! She is adorable and it is awesome they can be a part of everything even from so far away! That nursery is adorable! I used a Bath and Body Works gift card and took advantage of a great sale a few weeks ago and bought five big candles. And then that night I read about the chemicals in them and how dangerous they can be! Yuck! I will have to switch to soy! Love the house additions. What a steal on that nightstand. And the bathroom decor too. I also need a clock for the bathroom. It's too easy to lose myself in thought & hope out of the shower only to realize I am late! I love nursery! So beautiful! I hope you all are feeling better soon. I don't shop CL much but I think we will be when we find a place to live because we don't have a lot of furniture. I'm so sorry you all had the stomach bug. That is awful!!! I had that way too many times in Myanmar. ew! I like the decor. It's pretty. I have seen the At Home store but have never gone in. I'll have to go check it out ... after we find a place to live. I love the sign in your bathroom! It's very cute. Also, the rocker and nightstand. I had a rocker in our nursery, but the "table" next to it was a stack of boxes. Ha! I have pretty severe perfume allergy that, combined with my hound dog nose, makes me so sick. I want my house to smell pretty, but most candles give me awful migraines due to the chemicals and the floral perfumes. I'll look into soy wax ones! My new house has lovely combination of fresh paint and Japanese curry smell that needs to be remedied before I go insane. Essential oils do not cut it. Your home looks so cozy and well put together. Come help mine. R's face in the grocery cart photo says it all. 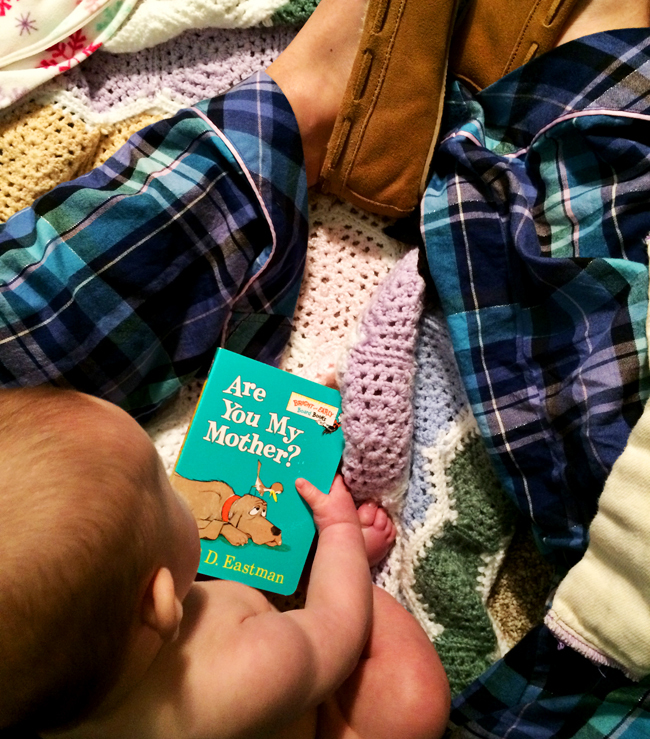 I've said it before and will say it again: that is one cute baby. Love the sign you got to go in the bathroom- it looks great! 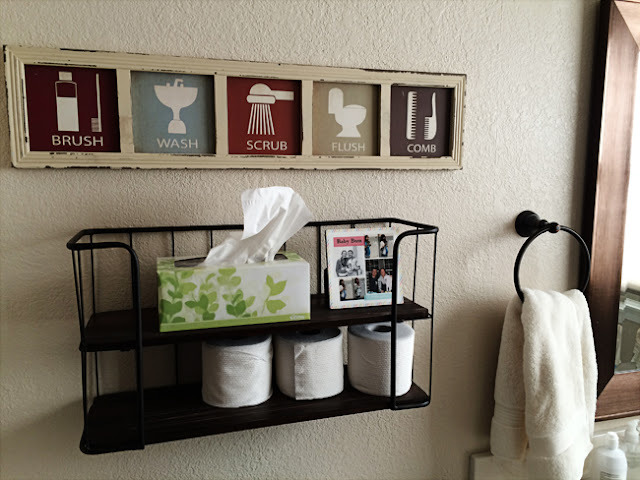 And reminds me that I still need a little storage thing in our own bathroom like that. Hobby Lobby you said previously, right?! i love craigslist! i look all the time, but since i don't want to go to a potential crazy person on my own, i have to suggest / ask KC and he always shoots me down haha. the nightstand is fabulous though! and 5 years is definitely a long time, it's the longest you've been married ;) haha. congrats! Right this exact second I'm smelling the second piece of pizza I didn't eat from my lunch :) Also, if I didn't have a clock in my bathroom I'd never be on time anywhere...lol. Love the nursery! Hope you are all feeling better! Your household additions are great. Your little girl is so adorable!! 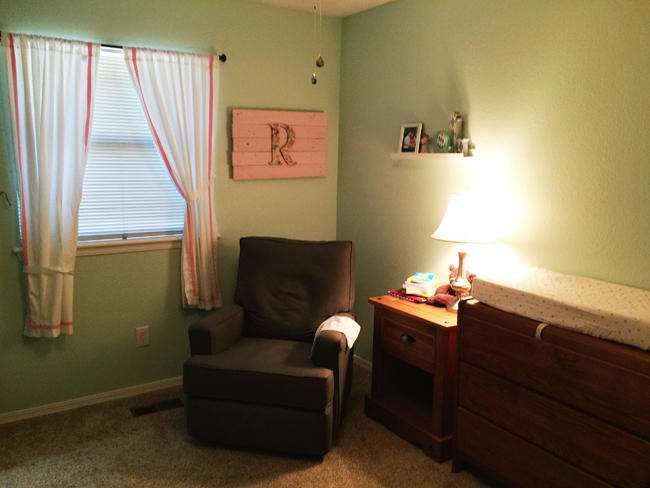 I love the nursery too, that rocking chair does look so comfy! We have a wooden one in my son's room and I like how it looks, but it's not that comfortable. Next time around I'm going for comfort!! I hope you're all feeling better now! I love Craigslist! We actually got our crib on there, a Land of Nod crib for $300 with the mattress that was originally $1200!!! Love the additions! Sometimes just adding one piece makes a huge difference in the overall aesthetic. Love it! I am literally not smelling anything right this minute, thank you for asking :) I love Craig's List! We got our dining room table there (which is a story in itself). I've also come across a couple local groups on Facebook set up for trading and selling, and those are great too. I LOVE your new nightstand! So cute, and an amazing deal! Oh, I'm sorry you and your husband were so sick! What a bummer to be sick at the same time. Right this second I'm smelling a residual scent left over from the shrimp scampi, which does not smell as good as it tasted. Oh my gosh that nightstand is the BEST! I'm so impressed with that shopping win! Also, my friend has the same rocking chair and said it was the most worth it thing they've bought- I can't believe you waited 2 months! I sat in it one time when I was watching their girl and it was the best.thing.ever. Also, I had no idea bath and body works candles weren't that good for you! I'll have to try these soy candles... where do you get them? ?